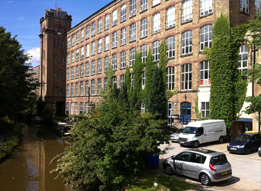 The Adelphi Mill is an award-winning Grade II listed former cotton mill which sits along side the Macclesfield Canal on the edge of the Peak District. The mill has recently been updated with a multi-million pound refurbishment to provide contemporary offices within a picturesque waterside setting. Both the Adelphi Mill, and its sister mill Clarence Mill, are located in Bollington, Cheshire, adjacent to Macclesfield canal. The canal, once used by the mills for cotton transportation, is now a popular location for narrow boating and canoeing. 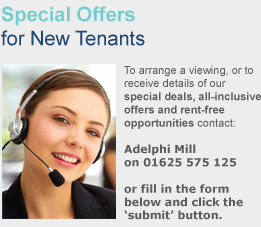 The mill is within walking distance of Macclesfield and Prestbury. Many of the staff working at the mill regularly enjoy a relaxing stroll or jog along side the canal. The mills are on the edge of the Peak District National Park, an area of outstanding natural beauty. Bollington has many fine walks, one of which is the well-known Middlewood Way, which runs from Macclesfield through to the centre of Bollington and beyond. Bollington benefits from a number of fine restaurants, hotels and golf courses which cater to the growing business community. There are also numerous fitness centres and spas in the area, including a modern, fully equipped gym inside the mill itself. Bollington has two beautiful parks, one being the Recreation Ground, which has been awarded coveted Green Flag Status for the last three years. This is the highest accolade achievable for parks, making it one of the best parks in the country. The mills are at the heart of the community. They are not only the home of the local community radio station but they also host the annual Bollington Extravaganza. Clarence Mill hosts the annual Floating Garden Festival and also donated office space to support those who were involved with the establishment of the Bollington Discovery Centre. 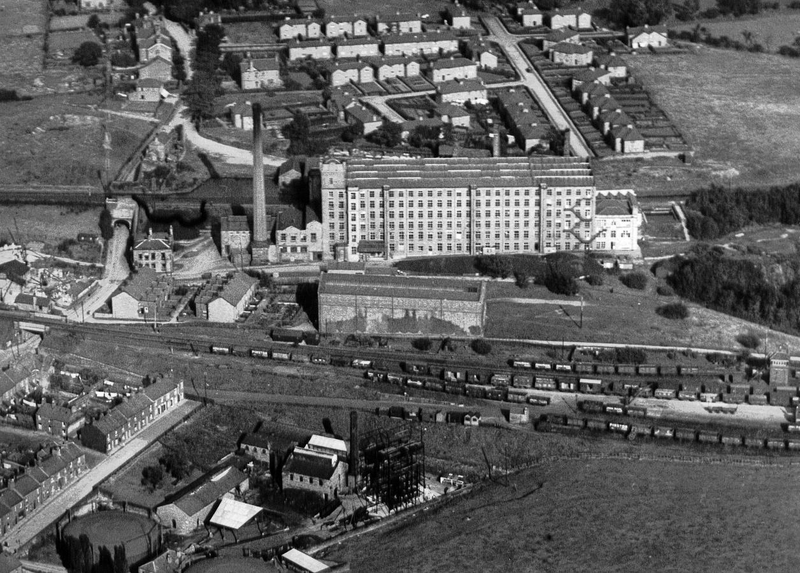 The mill was constructed in 1856 by Martin Swindells, a local cotton spinner, who also owned Clarence Mill. The Adephi Mill was built for Swindells’ two sons – hence the name ‘Adelphi’, which is the Greek word for brothers. The mill began with the spinning of cotton but was soon converted to the production of fine silk. Within three years of the mill being built, the railway came to Bollington, running virtually along side the mill. This soon led to a decline in canal transportation, but the Macclesfield Canal remained navigable and the UK’s very first narrow canal cruising club, the North Cheshire Cruising Club, was established there in 1943. 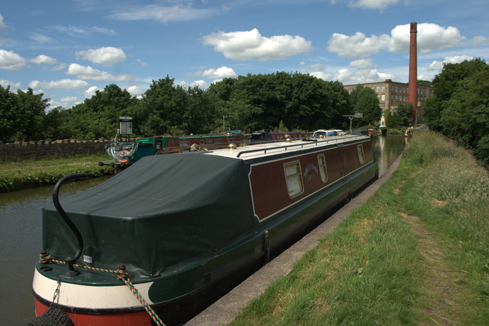 The use of the canal for leisure purposes has gone from strength to strength and it is now the most well-used and picturesque canal in the UK. 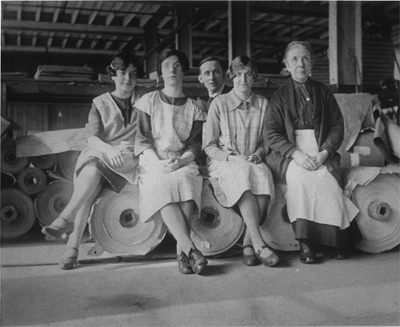 During the Second World War Adelphi Mill contributed to the war effort by converting to the production of parachutes. At the end of the 1960s the mill was acquired by Britax and used for the production of webbing until the 1980s, when the mill was first converted to offices.